SHANGHAI -- Shanghai Automotive Industry Corp. expects to start mass producing its first hybrid before the end of 2010, sources say. The car will be refitted from SAIC's existing Roewe 750, says an SAIC source. 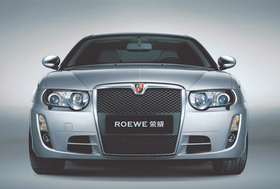 The Roewe 750 is a mid-sized sedan based on the Rover 75 platform that SAIC purchased from the England-based MG Rover Group in early 2005. The car will be a mild hybrid, which uses an electric motor to assist propulsion. The electric motor cannot power the car alone. Fitted with a lithium ion battery, the hybrid burns 20 percent less fuel the standard Roewe 750, says the SAIC source. U.S. supplier Johnson Controls will supply the lithium ion battery, while UK engine technology company Ricardo is working on the revised powertrain, according to industry sources familiar with the situation. SAIC also plans to launch an electric car after the hybrid, but no timeframe is available. In November last year, SAIC set up a subsidiary in Shanghai dedicated to developing new energy cars. With an investment of 2 billion yuan ($292 million), the new subsidiary will specialize in the development of powertrain and control systems for SAIC's hybrid and electric cars, according to a statement issued by SAIC. In 2005, SAIC partnered with the automotive engineering school of Shanghai-based Tongji University to develop new energy vehicles, including fuel cell cars. But SAIC's recent moves indicate that the state-owned automaker has shelved development of fuel cell vehicles, says Duan Chengwu, a technical research analyst with Global Insight in Shanghai.